Diamondback Firearms is proud to present the DB9, a micro-compact 9mm automatic pistol made entirely in the USA. Designed with safety in mind, the DB9 features a "ZERO-Energy" striker firing system with a mechanical firing pin block, a steel magazine catch to secure a sheet metal magazine and real windage-adjustable sights, all in a lightweight pistol. A steel trigger with dual connecting bars allows for a crisp, smooth, five-pound DAO trigger pull. The DB9 features a FEA (Finite Element Analysis) designed slide and barrel that is stronger than any comparable firearm, resulting in durability with less felt recoil, and the absence of removable pins or tools makes field stripping easier than ever. The slide, barrel, and internal parts are coated to resist corrosion, making this pistol a lifetime investment. Winner of both the 2006 Golden Bullseye Award and Handgun of the Year Award, the Springfield XD .45 ACP is a polymer-framed pistol with a 14 round capacity that gives you comfort and control while you shoot. The XD .45 features a fast recovery, allowing for rapid fire when you need it, without hindering your accuracy. 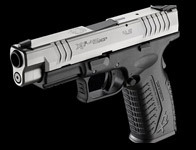 The Springfield XD .45 is ideal for self-protection and target shooting. Rumors started stirring in the fourth quarter of 2009 that Remington would start producing a 1911 handgun. That rumor proved to be true and the Remington 1911 model R1 was announced in the first quarter of 2010. The 1911 R1 was slated for release on May 1st, 2010 but to date it appears that few if any have shipped for consumer purchase. The R1 is being produced in Ilion, New York. The new FNX offers all of the features that dedicated handgunners want. The ergonomic polymer frame has a low bore axis for less felt recoil and improved control. The grip panels are checkered and ribbed for comfortable, no-snag carry. Four interchangeable backstrap inserts quickly adapt the FNX to your hand size. The profiled stainless steel slide has cocking serrations front and rear, and the 4" hammer-forged stainless steel barrel delivers pinpoint accuracy. Ambidextrous operating controls make the FNX perfect for competition or personal defense. Every FNX is made in the USA. Introducing the RUGER® SR1911,™ a classically styled pistol designed with all of the modern manufacturing advances that you have come to expect from Ruger. Accurate, rugged and reliable, the SR1911 is 100% American-made in American factories with American workers. Enthusiasts enjoy. Competition beware. The Ruger® LCP™ is a compact .380 Auto from the industry leader in rugged, reliable firearms. From backup firearms for law enforcement to licensed carry for personal protection, the LCP is the perfect choice. The 24/7 G2 is the culmination of the wisdom and experience of firearms designers who are passionate about performance. Combining the best features from the Taurus 800 Series, 24/7 Series and 24/7 OSS™, the new 24/7 G2 offers the best of all worlds. Features include "Strike Two" capability for incredible reliability, contoured thumb rests, a new trigger safety and balanced spring pressure for extraordinarily fast shooting. Check out the revolutionary, next-generation performance of the 24/7 G2 Compact. Available in 9mm, .40 cal. and .45 ACP with the features, accuracy and reliability of big brother. With all due respect to Sir newton, the KRISS engineers have been able to use his law to the shooter's advantage. Unlike any other firearm ever invented, instead of having all the recoil force slam back into the shooter's shoulder, causing massive amounts of felt recoil and resultant muzzle climb, the KRISS System absorbs and redirects these forces downward and away from the operator thus enabling him to better control and keep the KRISS firearm on-target. More control equals more rounds on-target, more of the time.